Looking for a new outdoor adventure? 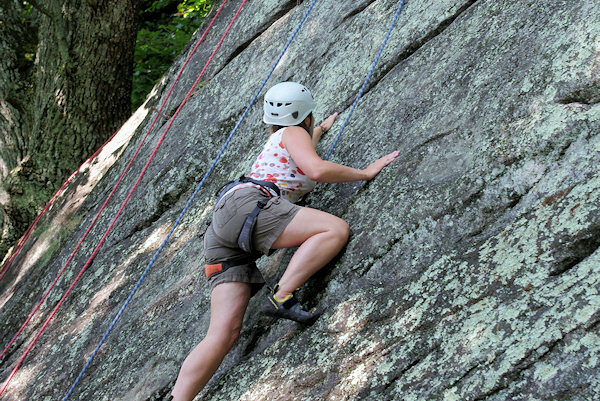 How about guided rock climbing and rappelling near Asheville? Chimney Rock Park is an incredible area that offers everything from beginner to advanced climbing opportunities throughout the year. They full and half days of single and multipitch climbing and rappelling at Chimney Rock Park, as well as a "Intro to Climbing," a two hour experience that encompasses all that climbing has to offer! The Intro to Climbing is ideal for those whole have little or no climbing experience that wish to see what climbing is about before possibly going on for a full day of private guiding. No previous experience is necessary and all equipment is provided. You will experience private instruction from AMGA (American Mountain Guides Association) Certified Instructors and Guides. They offer rock climbing and rappelling 12 months of the year (weather permitting). For more information, go to the Chimney Rock Park Web site. Rumbling Bald Mountain: This 1,100-acre collection of cliffs and boulders located in the non-fee area of Chimney Rock State Park. Though still somewhat of a hidden gem, Rumbling Bald is considered world-class bouldering and technical rock climbing with some of the best terrain in the Southeast. Its boulder fields contain an estimated 1,500 bouldering problems that are easily accessible. The most popular climbing seasons are fall and winter. Park in the designated parking area located off Boys Camp Road. Adventure Center of Asheville: If you love climbing, check out this playground just five minutes from downtown Asheville. In the Treetops Adventure Park, play in the trees with 60 unique climbing, zipping, walking, jumping, swinging, and rappelling challenges anchored to 30 trees and towering poles. There are five different adventure trails for all skill levels. It's a self-guided two-hour playtime on this "Jungle Jim", so you move at your own pace to create an adventure based on your comfort levels. At TreeQuest, climb trees with a state of the art controlled decent device that clips into your full body harness and slowly lowers you whenever you choose to return to the ground. TreeQuest has a progressive level of climbs allowing you to increase your challenge as you conquer tree after tree. It's popular for birthday parties, friend outings, family time, or group adventures. For ages 4 and up. Read more! Rock Climbing in Downtown Asheville: Climbmax in downtown offers simulated rock climbing, indoors and outdoors, at their fun facility on Wall Street. They also offer guided rock climbing trips.